John follows up his warning about false teachers with this imperative and promise. Christians know the truth and ought to remain in it. In this faithfulness to the original gospel is the promise of eternal life, v. 25. Many have left the original message for a false teaching. While what we heard from the beginning remains in us, we must call others to return to it. This is the restoration appeal. Peter denied his Lord three times as Jesus was being tried. Now, the Lord allows him to affirm his love three times and points him to his future service in the kingdom. What message is there for us in this restoration of Peter? Jesus healed a blind man and upset the abnormal human state of affairs. When Christ restores us to God, how does that disturb people? Note: The following text is from Chris Underwood, from Chicago. Chris is in SJCampos for three months working with Embraer. It’s been a pleasure to have him in the congregations here. He sends out a monthly “Encouragement Note” and graciously allowed us to share it here. You probably know people who came to Christ late in life or saints who fell away and repented only after years had passed. All of them lament, to one degree or another, the time wasted in the world. They know how short life is. They are also aware of how much there is to learn and to do in the kingdom of God. They don’t let their regrets immobilize them, however. They are often among the most dedicated servants of the Lord. How are you, your family and the saints at Sullivan church doing? I am pleased to inform you that our University has satisfied all the conditions to merit a permanent license from the National Universities Commission. We have passed the probation stage. Thank you for your prayers and support for this work. I have attached a copy of the letter from the Commission here. There is a question some one asked me and I could not deal with it satisfactorily. Will the church in our age or oncoming age restore the church fully before Christ comes? It will be a pleasure to hear from you. Greet the saints there for us. We plan to leave for Nigeria, the Lord willing at the end of this month. Moses, Thank you, brother for the information. It is great to hear and it is great that the work is going that good for recognition. With regard to the question, it is my view that the structure of the church is clearly restored. That is, the NT order of elders, deacons, and the various members of the church carrying their load to serves the Lord in the congregational setting. If a congregation is fortunate enough to have a preacher who works alongside the members, then that is all the better (a lot like Paul left Titus in Crete or Timothy in Ephesus). Now, if there is a compromise of NT teaching, then to that degree (or point) there is no proper restoring taking place. In another respect, with regard to the life of the individual saint, there will always be a “work in progress” with regard to restoring NT Christianity (cf. 1 Peter 2:21-25). Along this line, we all rely on the Lord’s mercy to make up the difference (for we lack much) when He returns. I hope this helps, brother. If I can be of any further help, I will be at the ready to serve you. Have a great day, brother! “There is one body and one Spirit—just as you were called—one Lord, one faith, one baptism; one God and Father of all, who is over all and through all and in all” Ephesians 4:4-6. 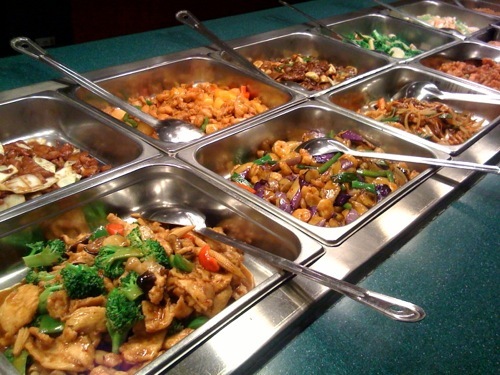 Many like buffet restaurants that give us a good excuse to eat as much of our favorite foods as we want. We pick and choose what we like while rejecting what we don’t like. A church with roots in our fellowship is urging prayer for different countries by including links on Twitter to a missionary society. Yet another example of how far from the biblical pattern people will go once they surrender a commitment to be true to the Word. Afterthought #1: This post has been sitting for a day. I wondered if it was worth posting. I don’t like pointing out negative things. That I posted it ought to answer the wonderment. Afterthought #2: This morning I latched on to Pro 14.14 for my daily thought: “Backsliders get what they deserve; good people receive their reward.” Maybe I shouldn’t try to connect it with this post? Vs. 23-28 acknowledge that only God can help. Though the author of this Psalm is unidentified, the reference to “Zion” (Jerusalem) needing to be restored (verse 13) places the time frame at the end of the Babylonian Captivity (2 Chronicles 36). Psalm 102:25-27 are quoted in Hebrews 1:10-12 as an address to the “Son” of God (Hebrews 1:8). Therefore this reference in Psalm 102 was far-reaching toward “the generation to come” (verse 18), and the work of the eternal Son of God (Acts 20:28; Ephesians 2:1-21). Verses 1-11: This begins with an urgent appeal for God to hear (verses 1-2) because: (verse 3) life is brief as smoke and fire; (verses 4-5) the heart is burdened and body aches; (verses 6-7) loneliness is like the “pelican,” “owl,” “sparrow” all out of their element, and keeps the Psalmist “awake;” enemies are active (verse 8); food doesn’t appeal (verse 9); the feeling of alienation from God (verses 10-11) is like a lengthening shadow. Verses 12-22: God, however, is capable of helping because He: is timeless (verse 12); has reached the end of the 70 years of exile for Judah/Israel (verse 13; 2 Chronicles 36:15-23; Jeremiah 25:8-14); sees His people seeking to return to the Promised Land (verse 14); preserves His people (verses 15-17); will see that this return is preserved in Scripture for all time (verse 18; Ezra-Nehemiah; Haggai; Zechariah; Malachi); is merciful and forgiving (verses 19-22). Verses 23-28: Our lives are in the hand of God (verses 23-24a), but God is above all time constraints (verses 24b-27), and eternity is for those who faithfully serve Him (verse 28; 1 Peter 1:23-25; 1 John 2:17). Pardon my tardiness on responding to the daily nudge, “What needs to be restored?” I’ve been on business travel, but did want to respond. I think this is a very important question and one we should be constantly asking ourselves. After all, we are commanded to examine ourselves. I believe one of the biggest things that needs to be restored is zeal and enthusiasm for Christ, His church, and His mission. It has been said that 80% of the work in any congregation is done by 20% of the members. Sadly, this does seem to be the norm. So many seem to think that showing up when the doors are open (or worse, once a week to take the Lord’s supper) is all that is required of them. Zealous people are not pew-warmers. Zealous people will be as the early church, teaching everywhere they go. If we are on fire for the Lord, then the church WILL grow. I fear we as God’s people are very much lukewarm and complacent. That needs to change, or the Lord will spew us out of His mouth! In Matt. 28:19 the disciples were commanded to “Go make disciples”. This does not mean for us to invite them to our building to worship with us as is being practice by many congregations. Large magnificent building are built for the purpose of attracting people. We need to go back to the “Go” in making disciples. A lot more preachers and missionaries could be supported if some congregations would do with less grandeur. Another area we need to go back to is in the area of benevolence. Paul made benevolence a secondary mission of the NT church. It seems the only time we see the church as a whole get excited about benevolence is when there are disasters from hurricanes or earthquakes. However the sending of a few dollars to help a Christian family is ignored. I have come to believe some of the difference is grandeur. Just my two cents. Late but…..